Just one point out of a playoff spot and with a game on Tuesday against the Maple Leafs, the New York Islanders season starts now. One of the hottest teams in the NHL, the Isles are in control of their own destiny. With games in hand against the Boston Bruins and surging play on both ends of the ice, they look like a team ready for postseason play. At the start of the year, the Islanders were dead in the water. They weren’t getting scoring from their top line. The three-goalie quagmire reached its conclusion with Jaroslav Halak sent to the AHL. Andrew Ladd and Jason Chimera looked like awful offseason signings. Anything that could go wrong, did. Then, the Islanders shut out the Boston Bruins 4-0 on Jan. 16 and head coach Jack Capuano was fired. From there on, they have been an entirely different team. The Islanders success has everything to do with the leadership of their core. 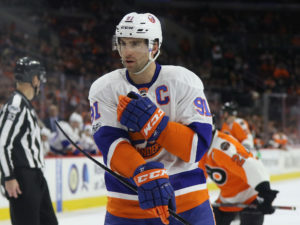 Over the last 12 games since Capuano’s firing, John Tavares has four goals and 11 assists. Nick Leddy has 10 points in that span as well. These are two players that need to lead by example on the ice. Since Capuano got the boot, that’s exactly been the case. The Isles have been just as solid in net as Thomas Greiss has won six of his last nine nine starts. And in the game he lost, the team hasn’t looked despondent. For a majority of the season, it felt like Greiss had to be perfect for the Islanders to get a win. With Tavares and Leddy thriving and Greiss poised, they are a tough team to beat every night. 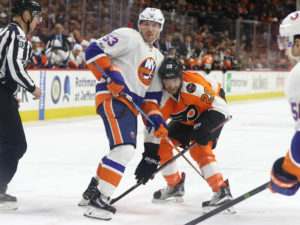 While the stellar play of Tavares, Leddy, Josh Bailey and Anders Lee this season has been the key to the changed fortunes this season, they haven’t been alone. With eight goals since Jan. 1, Jason Chimera has been a force and proven he’s still one of the best bottom-six forwards in the NHL. Ryan Strome has eight points in his last seven games and has far moe confidence. Although his defensive play is still suspect, his contributions on offense are pivotal. In order to make the playoffs, Strome, Chimera and Andrew Ladd (four goals in his last eight games) must continue to produce. Over the last 12 games, the Islanders are ranked six in the NHL with eight power play goals. They’ve been just as good shorthanded, giving up just one power play goal in 16 times short-handed since the All-Star break. Over the last two seasons, the special teams has often been mediocre or inconsistent. With the power play producing and Tavares anchoring the penalty kill with Nikolay Kulemin and Casey Cizikas, they have been steadier than ever. You’ve seen interim head coach Doug Weight smirk behind the bench. He sees the team is clicking. His confidence has been infectious and the Islanders are a better team because of it. Regardless of which direction they decide to go after the season, Weight has proven his value to the organization. The catalyst the team has needed to get back in the playoff picture, Weight has been a pleasant surprise. The Islanders season is far from over and as a result, Weight’s coaching career isn’t either. With 28 games left to play, anything can happen the rest of the season. But thanks to reinvigorated play on both ends of the ice, the Isles are doing anything but playing spoiler.